Sharron P. Schlosser, professor in Samford University’s Ida V. Moffett School of Nursing has been selected for induction into the National League for Nursing’s Academy of Nursing Education, with the credential of Fellow. Schlosser, who has been a member of the Samford faculty for 40 years, joins the Academy’s 202 Fellows representing nursing schools and programs throughout the United States. 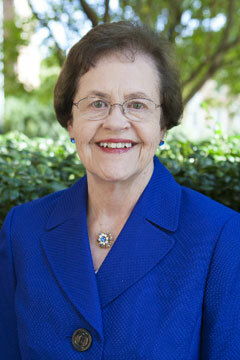 “We are delighted that Dr. Schlosser has been recognized for her contributions to nursing and nursing education. As a nurse educator and the chair of Samford’s graduate option in nursing education, she is a teacher of teachers and impacts generations of future nursing professionals in our state and across the country,” said Eleanor V. Howell, dean of Samford’s nursing school. “Her commitment to academic excellence is reflected in the quality of courses she teaches, her mentorship of nurse educators, her service as an evaluator of B.S.N. and higher degree educational programs for the Commission on Collegiate Nursing Education, as well as in her personal commitment to continue to learn and grow,” added Howell. The NLN established the Academy of Nursing Education in 2007 to foster excellence in nursing education by recognizing and capitalizing on the wisdom of nurse educators who have made sustained and significant contributions to nursing education. Fellows provide leadership in nursing education and in the Academy of Nursing Education, and support the vision of the NLN to promote standards of excellence in nursing education. Fellows serve as important role models and resources for new educators and for those who aspire to become nurse educators. “The National League for Nursing relies on these accomplished individuals as allies in our efforts to address the ongoing shortage of nurses and nurse educators,” said Beverly A. Malone, NLN chief executive officer. “Nursing faculty and colleagues from other fields who contribute to excellence in nursing education and to the preparation of a nursing workforce that advances the health of the nation and the global community deserve this public recognition and the gratitude of all who are eager to elevate the status of the profession,” Malone added. As a newly named fellow, Schlosser has been lauded for her innovative teaching and/or learning strategies; nursing education research; faculty development; academic leadership; promotion of public policy that advances nursing education; and/or collaborative educational, practice or community partnerships. She will be inducted as a new fellow at the NLN’s annual Education Summit in the fall. “It is an honor to be recognized by a national panel of my peers for my contributions to nursing education,” said Schlosser. “My selection as a fellow validates that my work has had a meaningful impact on transforming nursing education and preparing graduates for their future roles, and for that I am truly grateful,” she added. Schlosser has dedicated her career to educating future nurses and nurse educators at all levels of nursing education. She is regarded as a mentor to colleagues and students and a leader, expert, and scholar in program development, program and outcomes evaluation, curriculum development and use of active teaching strategies. She is also recognized for her work in culture care in nursing education, practice and research. She was the first nurse in Alabama to earn certification as a transcultural nurse and one of the first three nurse educators earning the Certified Nurse Educator credential in 2005 with the initial exam. In October 2014 she earned certification as an online instructor. Her current research focuses on the caring climate in schools of nursing. At the national level, Schlosser has served as board member and secretary of the Transcultural Nursing Society and she is currently a member of the NLN's CNE test development committee. Based on her work as co-chair of the Alabama League for Nursing's Annual meeting, she received the NLN award for Outstanding Leadership of a Constituency League at the 2014 Education Summit. She also served as an onsite evaluator for NLN accreditation and currently is a team leader for the CCNE accreditation process.